Pioneers in the industry, we offer monarch pocket laser tach 200 (plt200), monarch pocket tach 99 (pt99), stroboscope nova-pro 100 led (strobe or tach), nova-pro 300 led strobe or tachometer, stroboscope - nova-pro 500 led (strobe or tach) and monarch palm strobe x from India. 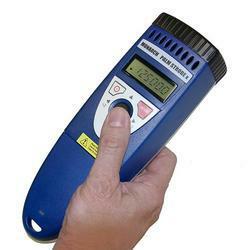 Pocket Laser Tachometer 200 tachometer / timer/ totalizer with N.I.S.T traceable certificate of calibration, and 12 in. of Reflective Tape. KIT also includes Carrying Case and Remote Contact Assembly for contact speed measurements. 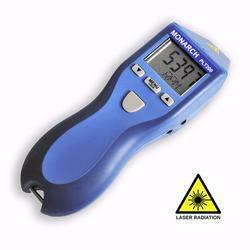 The Monarch Pocket Laser Tach 200 (PLT200) is a digital, battery-powered portable optical tachometer, which operates up to 25 feet* from a reflective target using a laser light source. The ergonomic design allows safe, direct line-of-sight viewing of both the target and the display at the same time, while providing a non-slip rubber surface for single hand operation. PLT200 is a 32 function Tachometer / Ratemeter, Totalizer / Counter and Timer (stopwatch), which is programmable in both English and Metric linear rates. Support is built-in for both our optional Remote Contact Assembly (RCA) and our Remote Sensors. PLT200 has a TTL compatible Pulse Output to trigger devices like data collectors or stroboscopes. * performance subject to intensity of ambient light irradiation. 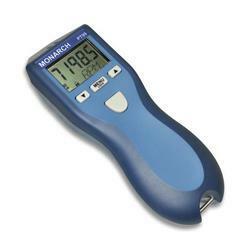 The Monarch Pocket Tach 99 (PT99) is a Basic non-contact optical tachometer. It comes with 12 inches of T-5 Reflective Tape. Also available with optional NIST calibration certificate. The Monarch Pocket Tach 99 is a digital, battery-powered portable non-contact optical tachometer (red LED), which operates up to 36 inches from a reflective tape target using an LED light source. The ergonomic design allows safe, direct line-of-sight viewing of both the rotating target and the display at the same time, while providing a no-slip rubber surface for single hand operation. Pocket Tach 99 in the value-leader of the world-class Pocket Tach Series from Monarch. Monarch has combined all the features of the hand-held LED stroboscopes together with a full function laser tachometer to create a compact, ergonomic and extremely powerful two in one predictive maintenance tool. The Nova-Pro 100 stroboscope light source is made up of twelve LED’s which are extraordinarily bright yet extremely efficient allowing cool continuous operation and extremely long battery life (up to 19 hours on a single charge). Continuous operation is also possible with the optional AC adapter. Designed for simple stroboscopic stop motion inspection and RPM measurement applications. The integral laser module is an optional item that can be added to make the 100 a full featured tachometer. Includes Strobe, standard Li-ion battery pack, battery charging station with interchangeable wall plugs and operation manual. Kit also includes plastic latching carrying case. AC Models include 115/230 Vac wall adapter power supply with USA, UK, AUS, Euro adapter plugs and operation manual instead of battery pack and charging station. We have combined all the features of our hand-held LED stroboscopes together with a full function laser tachometer to create a compact, ergonomic and extremely powerful two in one predictive maintenance tool. The stroboscope light source is made up of twelve LED’s which are extraordinarily bright yet extremely efficient allowing cool continuous operation and extremely long battery life (up to 19 hours on a single charge). Continuous operation is also possible with the optional AC adapter. Has all the features of the Nova-Pro 100. It includes the integral laser module for tachometer mode or strobe trigger mode and adds a high contrast inverse blue LCD display with back light and touch sensitive number pad for setting flash rates quickly, ultra-high intensity LED’s for even more light output, memory for up to 10 preset flash rates, input and output jacks for external sensors or pulse repeater output and NIST calibration certificate. Has all the features of the Nova-Pro 300 and adds an additional standard battery pack, remote laser docking station, phase delay, time delay and virtual slow motion. Includes Strobe, integral laser module with remote dock, (2) standard Li-ion battery packs, battery charging station with interchangeable wall plugs, NIST certificate and operation manual. Kit also includes deluxe water tight latching carry case. AC Models include 115/230 Vac wall adapter power supply with USA, UK, AUS, Euro adapter plugs and operation manual instead of battery pack and charging station. The Monarch PALM STROBE X Offers excellent brightness, exceptional features and extra-long battery life. Unique one-touch joystick type button allows single hand operation for fast rational RPM tuning. Select mode of operation for internal tuning, external TTL input, tachometer display and x2 /2 functions. Eight memory positions provide rapid recall of user defined frequencies. The Monarch Strobe DBX 115/230 offers powerful features for both diagnostic inspection and speed measurements. Lightweight and bright with flash rates to 20,000 flashes per minute, these strobes are comfortable to hold and easy to operate. The dbx battery operated stroboscope weighs only 1.9 lbs. (0.86 kg) and will run continuously for 2 hours on a single charge. A fast charger is included and the percentage charge remaining may be displayed. The unit is CE certified. Individual input and output TTL jacks (1/8 inch phone) provides power to remote sensors and allows “daisy-chaining” of multiple strobes. A Tachometer mode allows accurate speed measurement up to 250,000 RPM using external sensors. The Monarch Nova-Strobe LED family of rugged industrial stroboscopes provide an extremely bright, uniform light output for performing stop motion diagnostic inspection and RPM measurements. The twelve LED light source is extremely efficient which means long battery life and continuous cool operation. A wide operating range of 30-500,000 flashes per minute covers all applications. The Monarch Strobe BBX represents the latest in portable stroboscope technology. 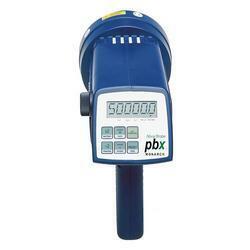 The BBX is simple to operate, just point and shoot. 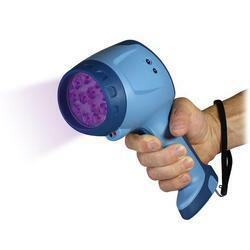 Lightweight and bright with flash rates to 10,000 flashes per minute (FPM) these strobes are comfortable to hold and will operate continuously with no danger of overheating. The bbx battery operated stroboscope weighs only 1.9 lbs. (0.86kg) and will run continuously for 2 hours on a single charge. A slow charger is included. Re-charge time is 14 hours. All new Nova-Strobe BBX provides a low-cost digital display stroboscope. The Monarch Strobe PBX 115/230 (Phaser-Strobe) incorporates the unique design features of the Nova-Strobe dbx with an increased operating range of 30 to 50,000 flashes per minute, as well as external phase- shifting. The unique digital adjustment knob can select the decade for adjustments, so coarse and fine adjustments of flash rates are made quickly and with significantly better resolution than competitive units. The memory feature of the Phaser-Strobe pbx allows nine flash rates to be stored – displayed in flashes per minute or flashes per second. Phaser-Strobe pbx operates with internal rechargeable batteries or continuously from AC line power with the power supply/recharger. The Nova-Strobe series represents the latest in portable stroboscope technology. The bax is simple to operate, just point and shoot. 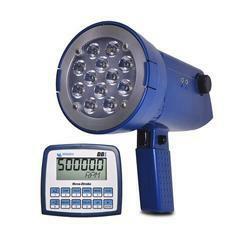 Lightweight and bright with flash rates to 10,000 flashes per minute (FPM) these strobes are comfortable to hold and will operate continuously with no danger of overheating. 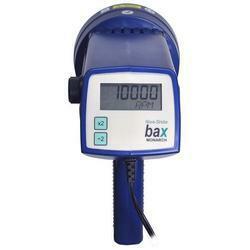 The bax stroboscope is AC mains powered (115 or 230 Vac). A large digital LCD is easy to adjust and read. The flash rate adjustment is quickly made with the tactile tuning knob. The MONARCH LED NOVA STROBOSCOPE DBL industrial stroboscopes provide an extremely bright, uniform light output for performing stop motion diagnostic inspection and RPM measurements. The twelve LED light source is extremely efficient which means long battery life and continuous cool operation. A wide operating range of 30-500,000 flashes per minute covers all applications. The Deluxe DBL adds internal phase shifting, memory for up to 5 preset flash rates, N.I.S.T. calibration certificate and tachometer mode for speed measurements up to 500,000 rpm using optional remote sensors or TTL pulse input/output. The Monarch Nova-Strobe LED family of rugged industrial stroboscopes provide an extremely bright, uniform light output for performing stop motion diagnostic inspection and RPM measurements. The twelve LED light source is extremely efficient which means long battery life and continuous cool operation. A wide operating range of 30-500,000 flashes per minute covers all applications. The top of the line Phaser PBL has internal phase shifting, memory for up to 5 preset flash rates, N.I.S.T. calibration certificate and tachometer mode for speed measurements up to 500,000 rpm using optional remote sensors or TTL pulse input/output and adds external phase delay, time delay and virtual RPM mode. The PBL will also run continuously, 24/7 with the power supply/recharger. The Monarch Nova-Pro™ UV is a powerful portable visual inspection and speed measurement tool. For visual running inspection in security printing. Monarch has combined all the features of the hand-held LED stroboscopes now together with Ultra Violet 385nm wavelength LEDS. 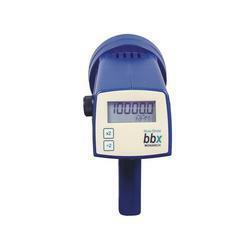 It includes a full function laser tachometer for performing non-contact speed checks of rotating equipment. The Nova Pro UV light has a lamp mode for continuous on inspection. The light source is made up of twelve LED’s which are extraordinarily bright yet extremely efficient allowing cool continuous operation and extremely long battery life (up to 19 hours on a single charge). Continuous operation is also possible with the optional AC adapter. It includes the integral laser module for tachometer mode or strobe trigger mode and adds a high contrast inverse blue LCD display with back light and touch sensitive number pad for setting flash rates quickly, ultra-high intensity LED’s for even more light output, memory for up to 10 preset flash rates, input and output jacks for external sensors or pulse repeater output. Features include phase delay, time delay and virtual slow motion. Each kit includes Strobe, integral laser module with remote dock, (2) standard Li-ion battery packs, battery charging station with interchangeable wall plugs, and operation manual. Stroboscope & Tachometer in one! Visual running inspections of: security printing marks, invisible ink bar codes, anti-counterfeiting printing, pharmaceutical packaging and monetary documents. Visual inspection of materials: textiles, OAA coatings, Non-destructive Testing (NDT), liquid and magnetic dye penetrants. Looking for Stroboscope & Tachometers ?